Looking for IBM Infoprint 1856 & 1866 Parts? All models of both MFPs include one 550-sheet drawer, and a 100-sheet multipurpose feeder as standard. Optional 550-sheet drawers and a 2,000-sheet drawer are available for a maximum input capacity 3,200 sheets. 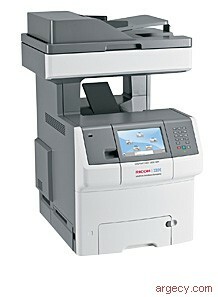 Output capacity is 250 sheets. Duplex capability is standard on all models. All models of both MFPs have one slot for additional SDRAM memory. Memory options for the printer include 256 MB, 512 MB, and 1024 MB memory DIMMs. All models have one slot for flash memory; a 256 MB flash memory option is available. All models of both MFPs include 10/100BaseTX Ethernet as standard. The maximum monthly usage for the InfoPrint Color 1856 MFP and InfoPrint Color 1866 MFP is 85,000 impressions. InfoPrint Solutions Company does not recommend printing to the monthly maximum on a consistent basis. InfoPrint Color 1856 MFP and InfoPrint Color 1866 MFP have five user selectable settings to balance print darkness and toner savings. The higher the setting, the darker the print. Within the range of print darkness settings, up to 50% toner savings can be realized from factory default setting of level 4. The toner darkness setting is available through the operator panel under the Quality menu and also accessible from the print driver. The following publications are shipped with the products. This will be available in the following languages: Arabic, Czech, English, Danish, Dutch, Finnish, French, German, Hebrew, Italian, Korean, Norwegian, Polish, Brazilian Portuguese, Romanian, Russian, Spanish, and Swedish. Simplified Chinese, Traditional Chinese, and Turkish. No supplies are required with the machine order. InfoPrint Color 1856 MFP and InfoPrint Color 1866 MFP are shipped with 6,000-impressions 2 black print cartridge and 6,000-impressions2 CMY print cartridges. Refer to table below for replacement print cartridges. It is the customer's responsibility to order and maintain an adequate inventory of toner cartridges and maintenance supplies. The pallet quantity for all models of InfoPrint Color 1856 MFP and InfoPrint 1866 MFP is one printer per pallet. Refer to the Prices section for ServicePac offerings. These products do not contain Licensed Internal Code or Licensed Machine Code.